Cloud Computing Projects is support for academic students & Research scholars .Master of Science is a research oriented master degree. 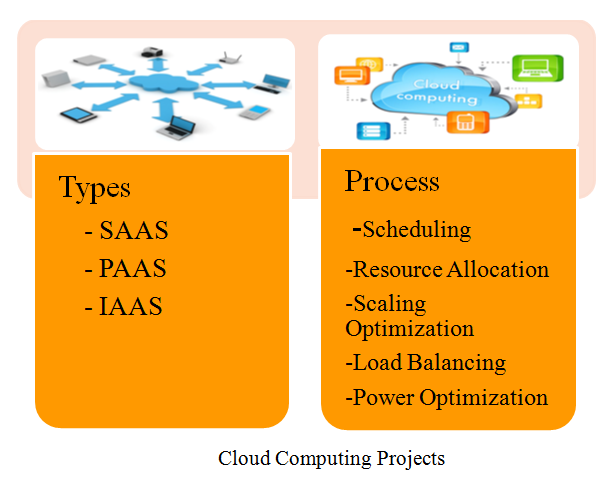 We offer MS projects in cloud computing for cloud computing research students with in depth knowledge of research problem in cloud computing area. Our project teams are conducting original research and writing thesis about cloud computing projects in a publishable quality, we support MS projects in cloud computing to enhance MS student knowledge in academic research area and elevate potential as PhD research level. We choose cloud computing project title by students based on own interest and background knowledge from science direct papers. Client part composed of interface and application needed to access cloud platform. Cloud part contain storage area, resource, security mechanism, host server, service & deployment model. we execute minimum energy needed process or enable DVFS technique to supply voltage/frequency to cloud servers. We adopt this programming model with hap pod map reduce framework to enhance energy efficiency servers. Initially we compute energy consumption level of each server performance & dynamically adjust data locality based on network status. When network is busy, cloud send less quality data to process else network ready to process large data, cloud can send process to specific server which is performed by efficient task scheduling algorithm. We implement cost efficient task scheduling algorithm to reduce monetary cost of non critical task. By this algorithm, we can evaluate and generate large DAGs with real world applications we perform this algorithm with optimization technique to enhance system performance. By this algorithm we can reduce overall cloud energy consumption level by fuzzy predictions. We adopt virtualized data center in this algorithm to achieve total availability, system performance responsiveness. We developed more than 90+ projects in cloud computing by our team in an efficient way.